Yuri starts with his own experiences as a young, healthy athlete eating a conventional, Western diet that consistently left him with fatigue, allergies and low-grade health problems. He places the blame for these problems squarely on the shoulders of cooked, "dead" food. The problem, of course, is that eating raw means you have to re-learn how to feed yourself and even how to think about food. Here is where this principles-centered guidebook comes in handy. It's one thing to just get started with a couple of good raw food recipes and a whole lot of motivation. If you want to change your life around, effort is a baseline essential. By learning the principles behind eating raw, you empower yourself to make better choices about food in general. Below, I've listed a few of my favorite insights from eating for energy. I'm afraid I've been guilty on this account one too many times in my life. Just reading these pages in Eating for Energy actually made the hair on the back of my neck stand up. It's too easy to work out hard and the gym and expect that you can eat anything. Sooner or later, imbalances come to the surface, and they aren't always pretty. If you really want to live a healthy life, you can't just shrug your shoulders and pat yourself on the back for a solid effort. It takes attention to your diet, too. Here is the flipside to the first point: how do you get buff without high protein intake? I've struggled with this problem in my own vegan and raw food experiences, and Yuri makes a number of good points here. One surprise is that Yuri is a proponent of whey protein isolate, but not concentrate. For some people, this section will be worth the price of the entire book. The 80/20 rule is making a huge comeback these days, but I've never thought about it in terms of food. One of the big hiccups I have had with raw and vegan diets is the rigidity. Thinking about "toxins" in your food is a fantastic recipe for an eating disorder. In Eating for Energy, Yuri scores major points for practicality by advocating a balanced approach that makes allowances for "leisure foods" while maintaining a high general standard of healthy (in this case, raw) eating. Avocadoes come from "the testicle tree"
Need I say more about this? Yuri's got quite a few outside-the-box nutrition points just like this one. Throughout this book, he makes big, bold insights into food techniques, ingredients, and pitfalls. Even if you never manage to shift all the way over to a raw food diet, you can't help but to make major improvements to your eating habits by reading this book. Oh, and did I mention that he lays out an easy, straightforward method for eating raw? 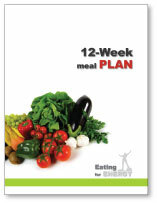 The product is also packed with bonus recipe guides and a 12 week eating plan to get you jump-started. Talking about the "energy" of food. I get where he's going by advocating eating food with better "energetic quality", but it doesn't resonate very well with my scientific background. The more you mention this stuff, the less I trust what you're saying. Still, enough of what he says makes sense to me that I'm willing to overlook some vaguely defined new-age "energy" talk. This isn't the first time I have disagreed with raw foodists, or even Yuri, on the rationale for the raw food diet--- it's not the same as disagreeing about the benefits of the diet. What you think about, comes about. Let's just say I'm not a fan of The Secret. I understand that getting people to eat raw is an exercise in motivational speaking, but if we could just think thin, fit, and healthy, then we wouldn't need this book in the first place. Life in Jock-world. Take one look at Yuri's picture, and it's clear that he's working primarily with athletes. I am glad he addresses a number of athlete-based issues head-on, because no one else out there is willing to do that. But while weight loss is a major selling point of this diet, there is a discernible bias towards helping fit people get fitter. This point may annoy some people, but it's still the best system out there for weight loss and overall health. Eating for Energy consistenly over-delivers. It's a complete guide to eating raw and an insightful read for carnivores who care about nutrition too. If you've enjoyed the contents of this page, you will be more than satisfied. Get Eating For Energy now. 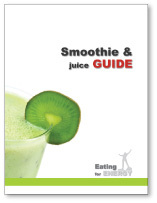 Have A Question About Eating For Energy? Was this review helpful? 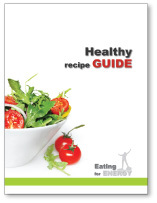 Do you have any more questions about Eating for Energy? Enter them here.